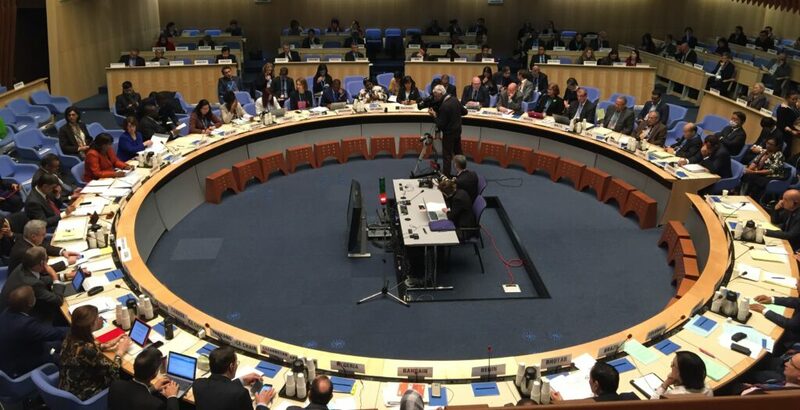 This week, a delegation of Global Health Council (GHC) staff and members will attend the 144th Session of the World Health Organization (WHO) Executive Board in Geneva, Switzerland. From January 24 to February 1, the Executive Board, which is comprised of 34 members, will meet to discuss the proposed programme budget 2020-2021, polio eradication and transition, health emergencies, the 11th International Classification of Diseases, universal health coverage (UHC), health, environment and climate change, access to medicines and vaccines, and preparation for the High-level Meeting of the UN General Assembly on UHC, among other topics. View the full draft agenda of the Executive Board and all related documents. GHC’s delegation followed the Executive Board proceedings closely and issued a number of statements throughout the week (see below). On the first day of the WHO Executive Board session we heard a lot from the secretariat, with the Director-General (DG) offering his remarks on the state of play and emphasizing a number of areas, including the General Program of Work (GPW), Global Action Plan (GAP), and WHO transformation (reform). He also made a strong statement on recent harassment claims, noting a “zero tolerance” policy. Member States then made their own comments on his report, including a group statement from the Netherlands, United States, and many others regarding sexual and other forms of harassment. It’s all online. The U.S. also made a brief statement in response to the DG, covering what we expected. Most of the day thereafter was spent reviewing WHO’s resource needs, fundraising tactics, and plans for restructuring or other internal reforms. Today we heard general support from member states for WHO’s 2020-21 budget but also a number of reservations around regional or disease-specific allocations, implications for future budgeting or fundraising, and metrics. The afternoon was then spent in a marathon polio session, with 40+ member states and non-state actors (including GHC) offering statements on eradication and transition. Drafting groups also met to develop anti-microbial resistance (AMR) and primary health care (PHC) resolutions. There was a private morning session until 9:30 AM, after which the meeting reopened to finalize regional appointments and get back to strategic priorities, starting with the 2030 agenda. This was supposed to be followed by a UHC discussion but, given the debate around draft resolutions (particularly for PHC), the discussion has been delayed until next week. While the EB made it through two of the sub-items related to Universal Health Coverage (UHC) – primary health care and community health workers – Member States continue to work on the resolution regarding the UHC High-level Meeting (HLM). Although the main committee room adjourned around 8 pm, the drafting committee was still meeting determined to have something by tomorrow for review. Mychelle Farmer, with NCD Child, read GHC’s joint statement on UHC this morning. And Dr. Tedros quoted from our statement (around the 1:50 mark in the morning session), saying, “As the Global Health Council I think said, primary healthcare is not just about facility. It’s from facility to community.” The EB also discussed item 5.2 on Public Health Preparedness, as well as hearing from Dr. Michal Ryan, the Assistant Director-General for public health emergencies, who presented on the ongoing response to the Ebola outbreak in the DRC. It appears that WHO has implemented several reforms since the slow response to the 2014 outbreak, and those reforms have led to better coordination and faster deployment of responders. WHO did not allow statements from non-state actors for this agenda item, so GHC and its members were not able to provide comments on this item. The day opened with the discussion on health and climate change, which was followed by access to medicines and vaccines, a sometimes contentious issue. The EB considered the proposed “Draft Roadmap for Access to Medicines, Vaccines and Other Health Products, 2019-2023.” Countries were generally supportive of roadmap, but concerns continue around issues of intellectual property (IP). Several countries, including the U.S., questioned whether WHO has the mandate to work on IP issues. The U.S. went so far as to request that previous EB and World Health Assembly (WHA) resolutions be provided that demonstrate this mandate. Ultimately, the EB recommended that the Roadmap continue to be refined leading up to WHA. Work continues on the UHC High Level Meeting resolution. Although the drafting committee worked late into Monday night, there are still a number of areas to be discussed. It was a whirlwind day! The EB got through 9 (!) agenda items today – including one that was not on the agenda. A resolution on improving WASH in Health Care Facilities advanced to WHA. GHC has worked closely with the WASH community over the past few years to raise awareness on the lack of basic WASH services in many health care facilities around the world. We were excited to support this resolution along with GHC member WaterAid. Expect to hear more from us on this as WHA approaches. During the discussion on Human Resources in Health, Jamaica and Australia are pushing for 2020 to be declared The Year of Nurses and Midwives. Dr. Tedros is keen on making this a reality. With the majority of technical items done, the EB will begin to shift into more internal matters, including engagement with non-state actors. However, a small number of major technical items are still left including the High Level Meeting on UHC and AMR. For the last day, the EB switched to more internal agenda items, including engagement with non-state actors (NSAs). In report 144/34, which focuses on WHO reform, Item E contains recommendations on NSA engagement with WHO. The recommendations include having NSAs submit statements two weeks prior to meetings such as WHA (currently statements must be submitted the day before an item is on the agenda), allowing Member States to review and consider them before the meeting; potentially limiting the number of speaking slots for NSAs, and encouraging them to submit statements in “clusters;” and the organization of an informal meeting with NSAs. At this point all of these are recommendations that continue to be developed and defined, and during the discussion Member States had several questions about the proposed informal meetings, including how to make sure it’s not just a “check the box exercise” and that discussion would actually feed into the formal process. Overall Member States, including the U.S., the UK, Canada, Germany, and Australia, were supportive of engaging NSAs outside of WHO formal meetings and hope the recommendations would enhance how NSAs participate. GHC knows that the value of attending the EB, WHA, and other governing meetings is the opportunity to submit a statement, but we need to ensure that additional mechanisms such as informal meetings are not substitutes for existing mechanisms, but rather supplement them.